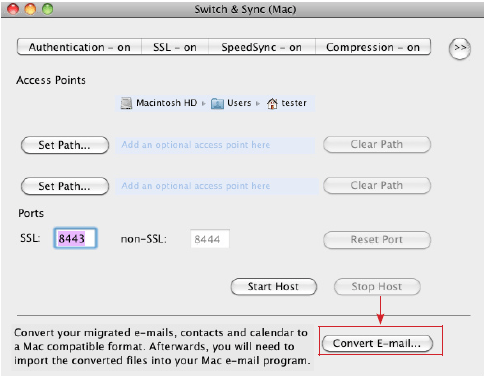 PROS: Switch & Sync is one of the easiest products to use in the synchronization area. CONS: Wireless users will not be able to use this product. OVERVIEW: Switch & Sync is a very basic software program; it does no more than synchronize and transfer data from a pc to mac, or vice versa. It transfers all data files, folders, photos, email, contacts, and calendar: –PC to Mac or Mac to PC. With the long standing history Lap Link has in the software industry, it’s surprising that they would put together a product that is as simplistic as they come, compared to their other offerings. Switch and Sync is no more than a glorified data transfer program to get files on a PC to a Mac. Using a USB cable, which is included with the package, you copy all your folders on the PC to the Macintosh. Both computers are synchronized if they are located on the same network. There’s no wireless support and that could prevent a home network user choosing this product, for obvious reasons. Once the connection is made to the Macintosh as the host, a wizard is displayed to walk the user through the first synchronization. This includes selecting the specified files or folders, their target destination. Advanced options include selecting if the files will be placed in locations other than original location of the source files ( ie. 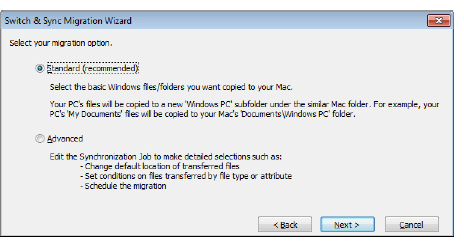 A documents folder on PC to an alternative folder on the Macintosh), scheduling, file exclusions and other conditions. Conflicts between two files are managed by the rules setup by the end user. This will prevent new files being overwritten or duplicates created. There are two settings that effect the speed of the transfer. The default “Speed Sync” is set to ON. You can make a setting change so that only the files that have been altered since the last sync session will be transferred. Also, you can select to have the data compressed as the transfer occurs. When transferring email on the PC to the Macintosh, the software will convert the PC email file to one usable in Outlook for Macintosh. There’s nothing worse than having a corrupted email file and no access to today’s critical communications avenues. Having that conversion done automatically for the end user is the first plus I’ve seen so far in this program. Just clicking on the Convert E-mail button takes care of the whole process. There is a limitation on the email programs though, supporting only Outlook 2000 or later, as well a Outlook Express 6, and Windows Mail. I found minimal security measures within the software. When connecting to the Macintosh as the host, a user name and password can be applied but are not required. The software also supports SSL. Additionally, if the system is on a network and the default port number is in conflict with an IT department’s security policy, it can be changed as shown. However, other security measures such as domain authentication and ACL’s don’t exist. Whether you download the software at Lap Link’s website or your make your purchase at a software retailer, you must expand the .dmg file to create an installer package, and then run the actual install. Using the software on the Macintosh or the PC is easy. The wizards ensure you take all the steps in order for the synchronization to be completed. LapLink believes that most of a user’s problems can be resolved by searching through their knowledge base or frequently asked questions. If neither of these contain the solution to your problem, they do provide a user guide for the PC and another for the Machintosh. If all else fails, you can contact the techs using a secure chat session. Support hours are Monday to Friday 9:30AM-8PM EST. Saturday 11-5pm and they do not offer Sunday support hours. 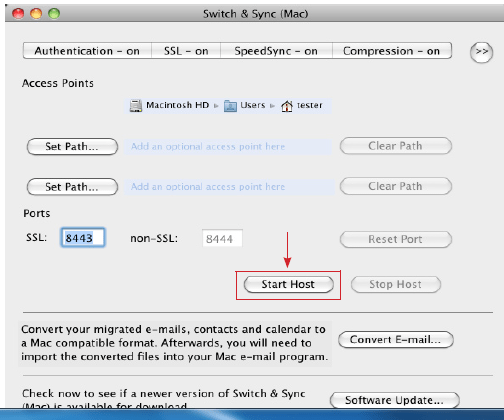 You are required to have a copy of Switch and Sync on each PC and Macintosh pair. A volume license is available for businesses with large numbers of networked computers. A USB cable is included in with the purchase. Swith and Sync delivers the minimum needed to get data transferred. Although one of the easiest products in the synchronization space, the trade off is the lack of full features provided on other synchronization products. Having no wireless is surprising, given the number of home networks and the computers on them. With limited security configurations, business users should strike this application on their desktop user’s wish list. With the myriad of sync manufactures, look elsewhere for a complete solution for all your phones, computers and home networks.